My 4th Tutorial is now available at my etsy shop - wirebliss.etsy.com. This tutorial is for beginners in wire jewelry. Details of the tutorial are down here. This tutorial teaches you one of the variations of the herringbone weave technique - a caged bead with a modified herringbone weave technique. When done, you may use this bead as part of your bracelet, necklace, anklet, etc, component. Tools - Bend nose pliers, round nose pliers and wire cutters. 27 crisp and clear close-up pictures with instructions. When you purchase this tutorial, I also include a FREE TUTORIAL on how to create a Two Tone Herringbone Weave Ring. 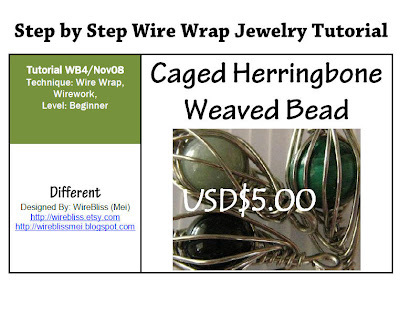 This tutorial was created by me during my first few months into the world of wire jewelry. It was shared for free in my blog for a while but has since been taken out from there. I am sharing it again here as a gesture of appreciation, especially for those who has not downloaded it before. Labels: Tutorials for a Fee , Wire Weaving | Knotting Share it!